2. 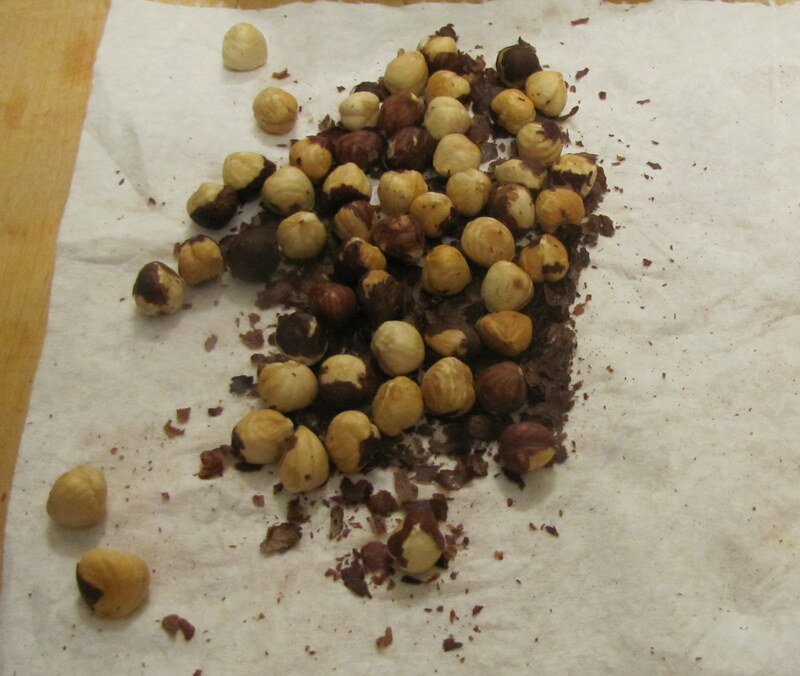 Place the hazelnuts in a single layer in a pan or on aluminum foil. Place the sesame seeds in a separate pan or on a separate piece of foil. Place the coriander seeds, cumin seeds, and peppercorns in a third separate pan or on a separate piece of foil. 3. Place all 3 pans/pieces of foil into the oven. Bake for 5 minutes, then remove the pan/foil with the spices. Bake 1 minute longer and remove the sesame seeds if they are pale beige. Bake the hazelnuts 6 minutes longer (total baking time 12 minutes) or until the nuts give off a distinctly nutty aroma. Remove from oven. 4. 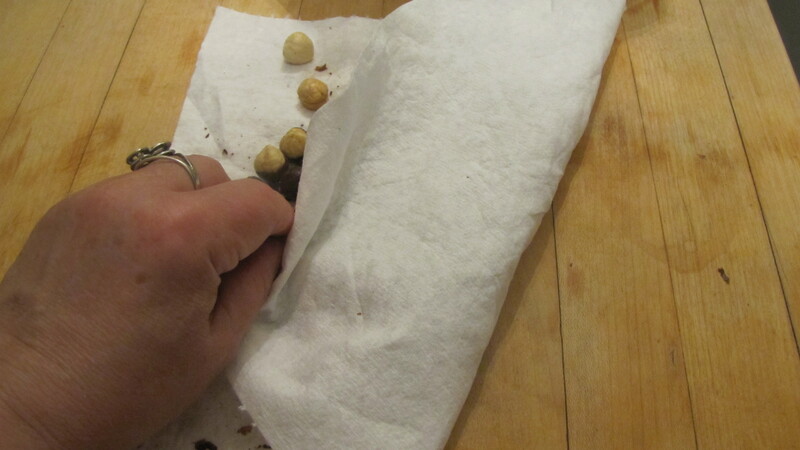 Place the hot hazelnuts between 2 pieces of paper towel. Rolling the nuts around, remove as much of the skin as possible (don’t make yourself crazy, some or even a fair amount of skin is fine). 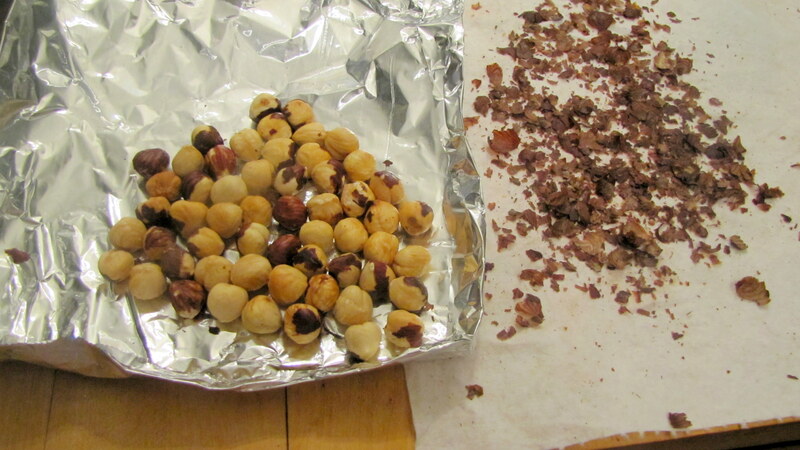 Discard the towel with the skin and let the nuts cool completely. 5. 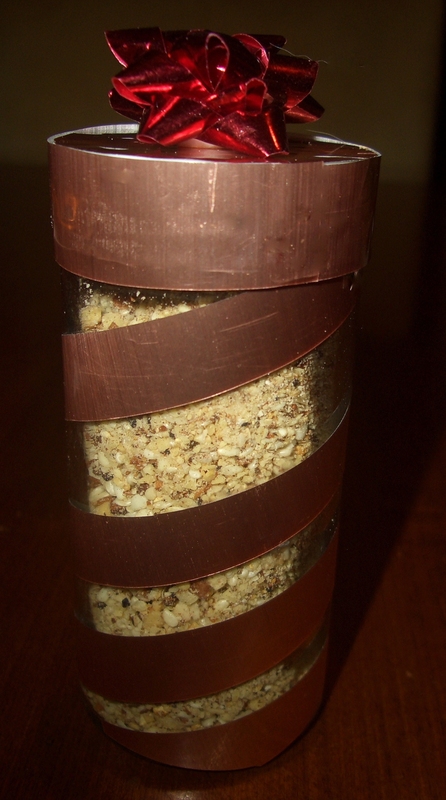 Put the spices, salt, and thyme into a mini food processor or spice grinder. Cover and pulse until ground, but stop before mixture becomes a paste. Empty container into a medium bowl or onto a piece of foil. 6. 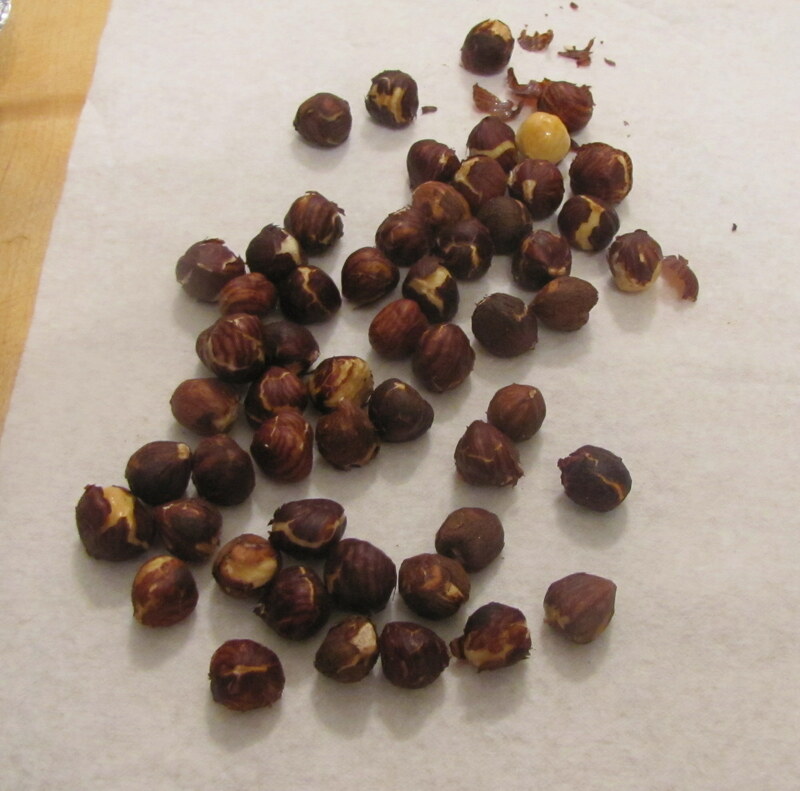 Place 1/4 cup of the hazelnuts into the mini processor or spice grinder. Pulse until finely chopped. Add to the spices in the bowl or on the foil. 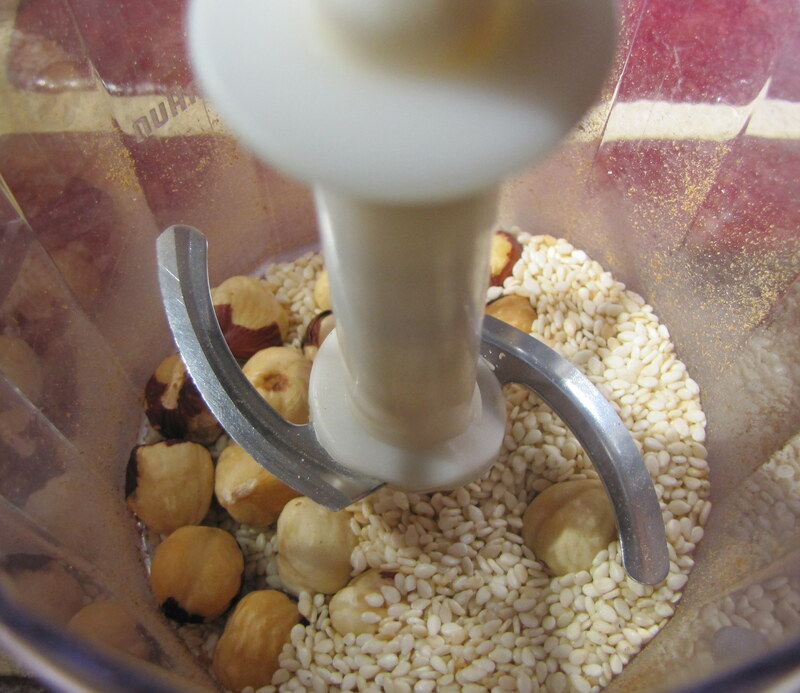 Place the remaining hazelnuts and 2 tablespoons of the sesame seeds into the processor/grinder. Pulse until finely chopped. Add to the bowl/foil along with the remaining sesame seeds. Toss until all ingredients are completely combined. Store in tightly closed container. 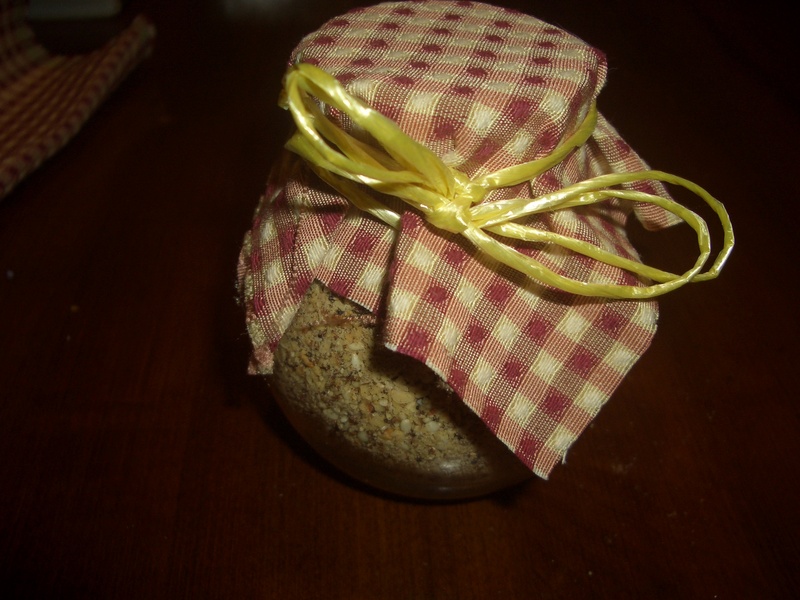 I use zatar, an Israeli seasoning, in this version. I’ve seen two types of zatar, one looks a lot like it has lots of flaxseed in it and the other is green and powdery – I use the green-powdery one. If you don’t have zatar, you can substitute poultry seasoning, but use only 1 tablespoon. 2. Place the pistachio nuts in a single layer in a pan or on aluminum foil. Place the sesame seeds in a separate pan or on a separate piece of foil. Place the coriander seeds, cumin seeds, and peppercorns in a third separate pan or on a separate piece of foil. 3. Place all 3 pans/pieces of foil into the oven. Bake for 5 minutes, then remove the pan/foil with the spices. Bake 2 minutes longer and remove the sesame seeds if they are pale beige. Bake the nuts 3 minutes longer (total baking time 10 minutes) or until the nuts give off a distinctly nutty aroma. Remove from oven. 4. 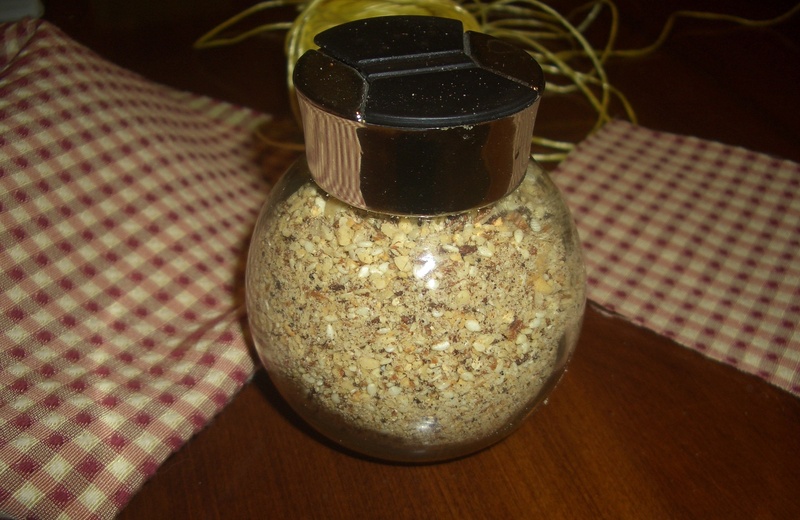 Put the spices, 1 tablespoon of the zatar, and the salt into a mini food processor or spice grinder. Cover and pulse until ground, but stop before mixture becomes a paste. Empty container into a medium bowl or sheet of aluminum foil. 6. 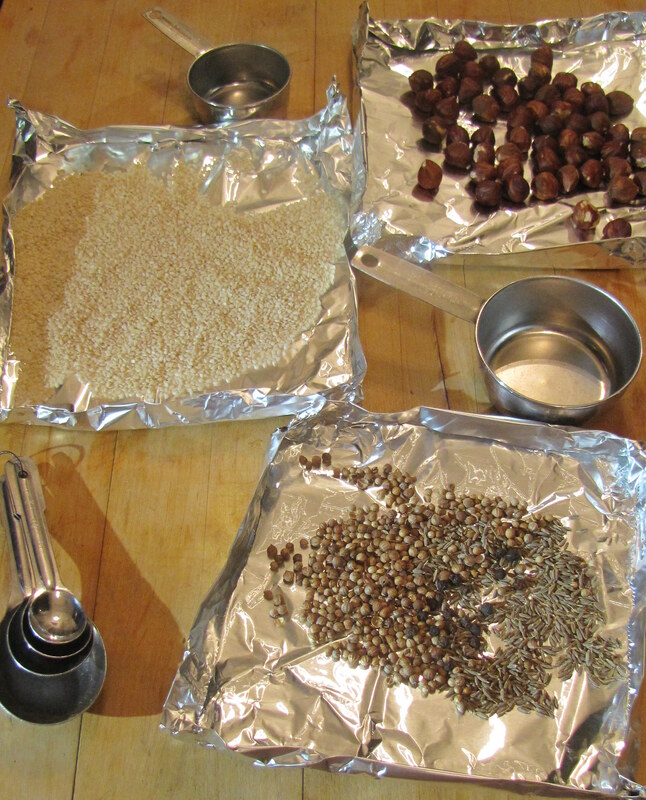 Place the pistachio nuts, 2 tablespoons of the sesame seeds, and the chickpeas into the mini processor or spice grinder. Pulse until finely chopped. Add to the spices in the bowl or on the foil. Add to the bowl/foil along with the remaining sesame seeds and the remaining tablespoon zatar. Toss until all ingredients are completely combined. Store in tightly closed container. The spices in this dukkah are based on those used on mulled drinks. 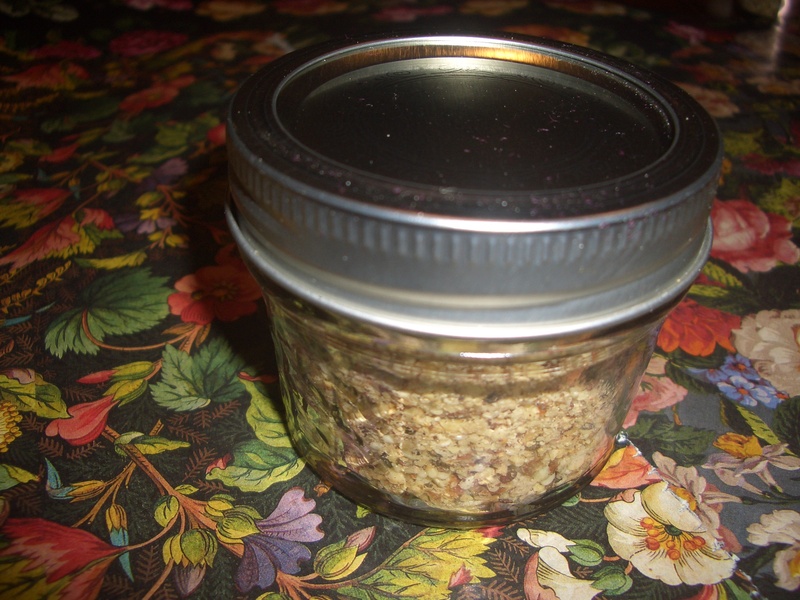 This dukkah is especially good with desserts and other sweet foods. Dip bananas in melted dark chocolate, then is this dukkah; let cool or freeze for a great treat. 2. 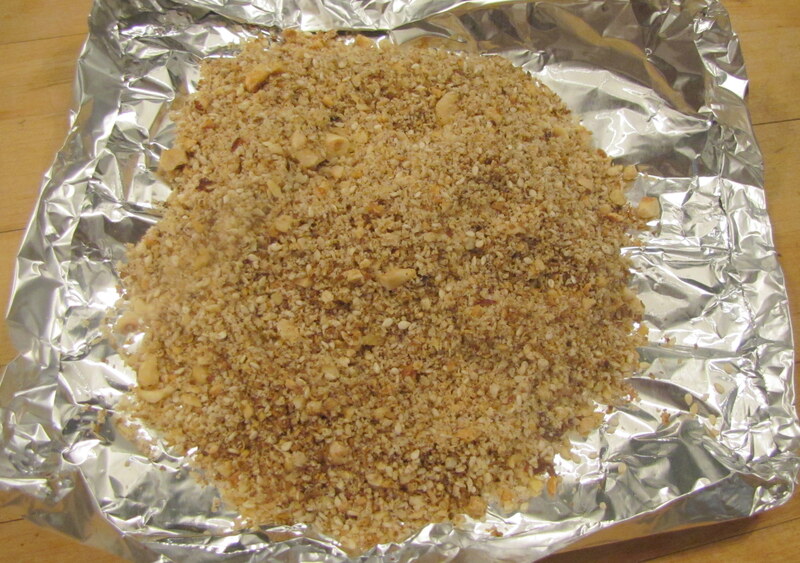 Place the almonds in a single layer in a pan or on aluminum foil. Place the sesame seeds in a separate pan or on a separate piece of foil. Place the broken cinnamon pieces, allspice, cloves, cardamom, and peppercorns in a third separate pan or on a separate piece of foil. 3. Place all 3 pans/pieces of foil into the oven. Bake for 5 minutes, then remove the pan/foil with the spices. Bake 2 minutes longer and remove the sesame seeds if they are pale beige. Bake the almonds 6 minutes longer (total baking time 13 minutes) or until the nuts give off a distinctly nutty aroma. Remove from oven. 4. 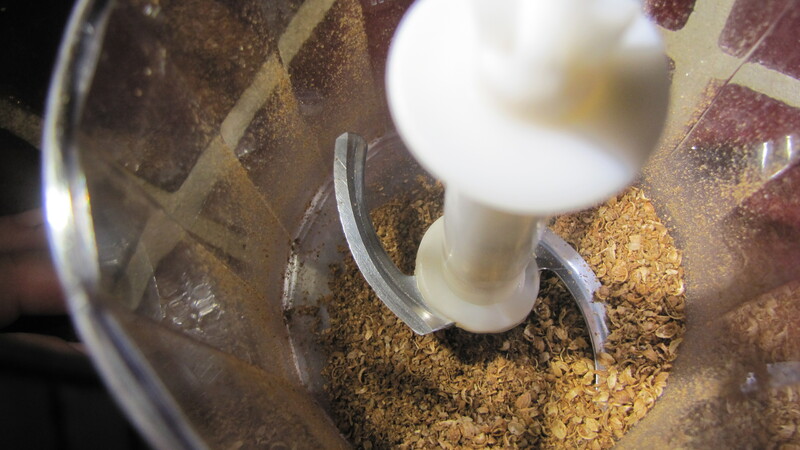 Put the spices, orange rind, and salt into a mini food processor or spice grinder. Cover and pulse until ground, but stop before mixture becomes a paste. 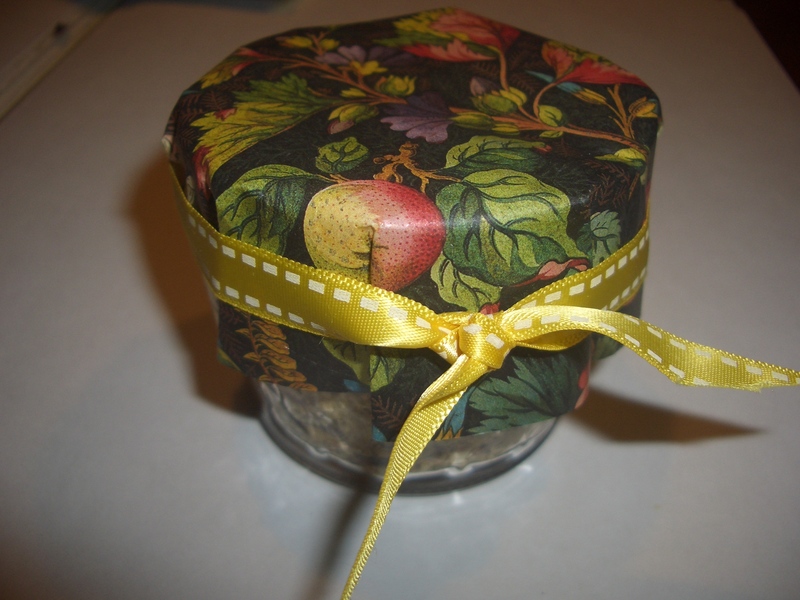 Empty container into a medium bowl or onto a piece of foil. 5. 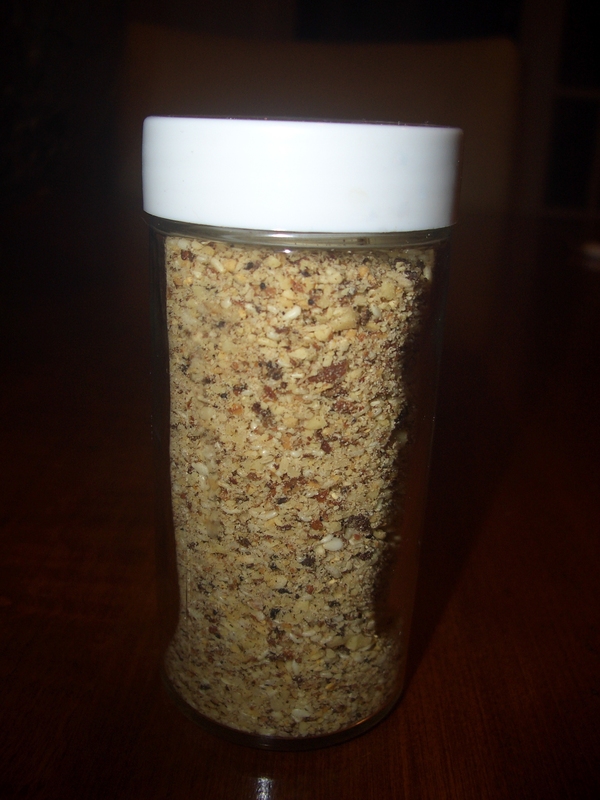 Place 1/4 cup of the almonds into the mini processor or spice grinder. Pulse until finely chopped. Add to the spices in the bowl or on the foil. 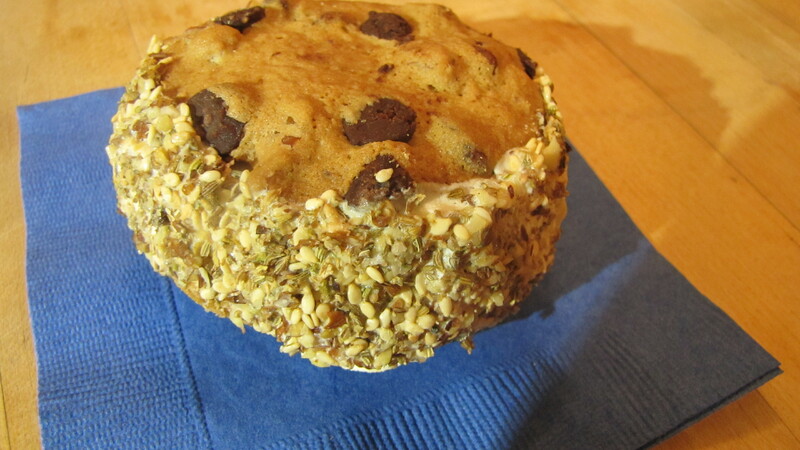 Place the remaining almonds and 2 tablespoons of the sesame seeds into the processor/grinder. Pulse until finely chopped. Add to the bowl/foil along with the remaining sesame seeds. Toss until all ingredients are completely combined. Store in tightly closed container.